Dr Woodruff is an NHMRC RD Wright Biomedical Research Fellow and Associate Professor of Pharmacology who leads a research team aiming to find new therapeutic treatments for neurodegenerative disease. Current therapies for these diseases are vastly inadequate, and so new research is needed to identify novel targets to slow or halt their progression. Dr Woodruff’s specific research revolves around the innate immune system in the brain, and the role of neuroinflammation in propagating disease. 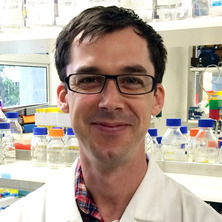 A key focus of his current work is testing new drugs developed at the University of Queensland in models of motor neuron disease (amyotrophic lateral sclerosis), Huntington’s disease, and Parkinson's disease, as well as maintaining an active interest in acute inflammatory disorders including sepsis. Using a series of potent and orally active complement C5a and NLRP3 inflammasome inhibitors developed at UQ, Dr Woodruff's team has demonstrated the therapeutic potential of targeting innate immune-mediated neuroinflammation to reduce neuronal cell death in animal models of these neurodegenerative diseases. His team has recently shown that in addition to their roles in neurodegeneration, innate immune factors also play essential roles in stem and neuronal cell development during embryogenesis, revealing the widespread physiological and pathological roles of this evolutionarily ancient immune system. Preclinical development of complement C5aR Antagonists for the Treatment of Motor Neuron Disease. The role of peri-neuronal nets in motor neuron disease: matrix barriers to hyper-excitability and local neuro-inflammation. Role of innate immune complement and toll-like receptor signalling in neurodegeneration. The generation and role of complement factor C5a during cerebral brain ischemia/reperfusion.